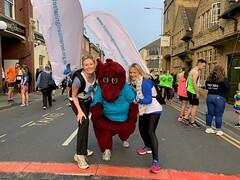 Somerset County Council and ‘Sparky’ the dragon are encouraging Somerset parents to protect their children in the sun this Bank Holiday. Exposing children to too much sun may significantly increase their risk of skin cancer later in life. Covering up, staying in the shade and using sunscreen are the best ways to protect children against the sun whether at home or abroad. Cllr. Anna Groskop, Cabinet Member with responsibility for health and wellbeing, Somerset County Council said: “Whatever your age, the best way to enjoy the sun safely and protect your skin from sunburn is to use a combination of shade, clothing and sunscreen. Children and teenagers might need a reminder or a helping hand, but setting a good example yourself is a great way to help them learn and get into good habits. • Spending some time every day playing outside with faces and arms uncovered will give children the Vitamin D that they need for strong bones. But parents need to make sure children don’t get too much sun and avoid sunburn. • When the sun is strong encourage children to play in the shade – for example, under trees or a parasol – especially between 11am and 3pm, when the sun is at its strongest. • Keep babies under six-months-old out of direct sunlight, especially around midday. • Cover exposed parts of children’s skin with sunscreen, even on cloudy or overcast days. Use a high factor sunscreen (at least SPF 15, preferably 30 or above) that is effective against UVA and UVB. Don’t forget to apply it to their shoulders, nose, ears, cheeks and the tops of their feet and reapply often throughout the day. If your child is swimming, use waterproof sunscreen and always reapply after towel drying. • Cover children up in loose, baggy cotton clothes, such as an oversized t-shirt with sleeves or get them to wear a floppy hat with a wide brim that shades their face and neck. • Protect children’s eyes with sunglasses that meet the British Standard and carry the “CE” mark (check the label or ask the manufacturer).